Home sleep apnea testing (HSAT) typically does not include electroencephalogram (EEG) monitoring for sleep assessment. In patients with insomnia and low sleep efficiency, overestimation of the sleep period can result from absence of EEG, which will reduce sleep disordered breathing (SDB) indices and may lead to a false-negative result. To validate a single channel frontal EEG for scoring sleep versus wake against full EEG during polysomnography, and then to examine the utility of adding this single channel EEG to standard HSAT to prevent false-negative results. Epoch-by-epoch validation for sleep scoring of single channel EEG versus full PSG was first performed in 21 subjects. 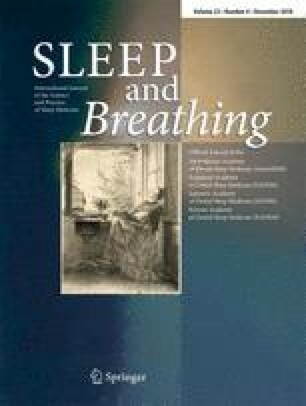 This was followed by a separate retrospective analysis of 207 consecutive HSATs in adults performed in a university-affiliated sleep center using the Somte (Compumedics) HSAT with one frontal EEG as well as chin EMG, nasal airflow, oxyhemoglobin saturation, respiratory effort, pulse rate, and body position. Each study was scored twice, with (HSATEEG) and without the EEG signal visible (HSATPolygraphy), to calculate AHI4 and RDI and the effect on OSA diagnosis and severity. Analyses were repeated in 69 patients with poor sleep suggesting insomnia plus Epworth Sleepiness Scale < 7 as well as in 38 patients ultimately shown to have sleep efficiency < 70% on HSAT with EEG. Single channel and full EEG during polysomnography agreed on sleep versus wake in 92–95% of all epochs. HSAT without EEG overestimated the sleep period by 20% (VST = 440 ± 76 min vs TST = 356 ± 82 min), had a false-negative rate of 8% by AHI4 criteria, and underestimated disease severity in 11% of all patients. Sub-group analysis of patients with subjective poor sleep suggesting insomnia did not change the results. Patients later shown to have low sleep efficiency had lower SDB indices and a 20.8% false negative rate of sleep apnea diagnosis. Although overall false negative rates using HSATPolygraphy were moderate, suggesting utility for ruling out OSA, there was a specific subgroup in whom there were significant missed diagnoses. However, we were unable to identify this subgroup a priori. This work was previously presented in the form of a thematic poster at the American Thoracic Society annual meeting in Washington, D.C., May 2017. The online version of this article ( https://doi.org/10.1007/s11325-018-1735-2) contains supplementary material, which is available to authorized users. This research was funded in part by grants from the NIH K24HL109156 (Principal Investigator: Ayappa, Indu), and the Foundation for Research in Sleep Disorders.